If finally feels like fall here in Arizona. Finally! I absolutely LOVE coleslaw. This Vegan Coleslaw is my most popular recipe on The Veg Life! I also did another version here using carrots and this one called Confetti Coleslaw. But this Brussels Sprout Slaw seemed appropriate for the season at hand. Plus, I adore Brussels Sprouts. Today, I am actually serving it as a salad. Yum! This recipe is quick and easy and the perfect side for your next dinner. 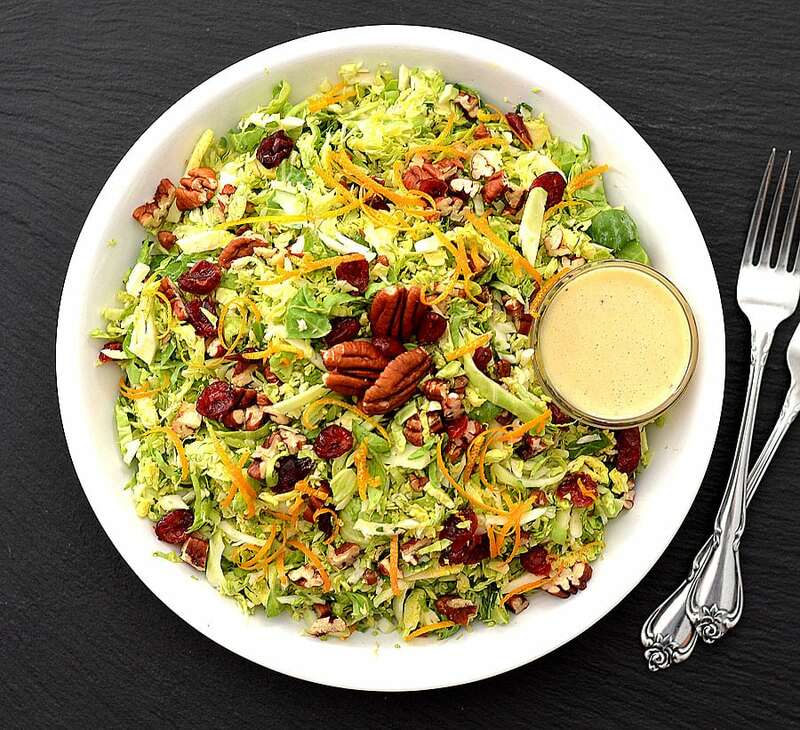 Shredded sprouts are tossed with a dressing made up of vegan mayonnaise, Dijon mustard, agave syrup, oil, champagne vinegar and orange zest. 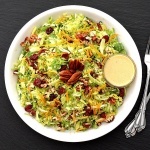 The slaw is then topped with toasted pecans and dried cranberries. Season with a sprinkling of salt and pepper and you are done! Festive, right? In a large fry pan over medium heat, toast the pecans just until golden. Cool and chop. Using a box grater or a food processor with the shredding attachment, shred the Brussels Sprouts. Coarsely chop and remaining pieces with a knife. In a small bowl, combine the vegan mayonnaise, dijon, agave syrup, oil, zest and whisk to combine. Whisk in the vinegar and orange juice until smooth. Toss in the Brussels Sprouts and season with salt and pepper. Transfer to your serving bowl and scatter the pecans and cranberries over the top.